WARNING: Make sure you've at least tried to install DirectX using the DirectX Installer first. DXFix is intended as a last resort if all other solutions have failed. Works on both 32 bit and 64 bit Windows. As this program modifies system files, be sure to disable anti-virus or other firewall / security software before downloading or running it. 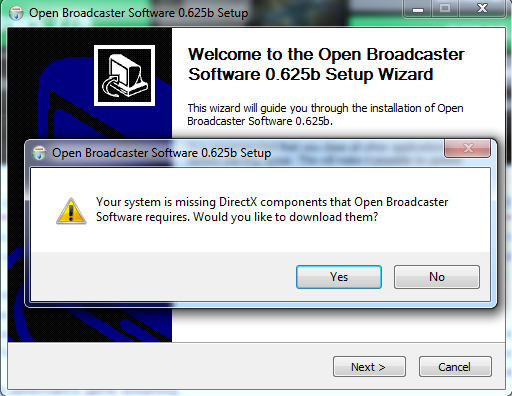 Do you have problems installing or running OBS and receive one of these errors, even after trying to install DirectX? These errors are often caused by the wrong versions of DirectX files being installed by some other application or game. The DirectX installer won't fix it because it does not check the file versions. DXFix will check the versions of DirectX files required by OBS and forcibly replace them if they are the wrong version. This should fix the majority of the above errors. Help find the root cause of problems! So I've gone on the /bin folder and tried to execute it : Xinput_1.3.dll missing.. fine I've extracted it from DirectX and add it on SysWoW and Sys32 and then Don't starve launch but "initializating error" and I just found it this topic and it works ! Fixed the "error during initialization" issue I was having with Don't Starve Together as suggested by the support thread. Absolutely amazing fixed exactly what my problem was and was super easy to use. Had the first two issues and this fixed it, thank you!!! Had the first issue posted and this program fixes it! now i can record any game! Had the first issue posted and this program worked like a charm! Ran a dialogue box that said it did things but did not fix the problem.